As part of the XPages development contest sponsored by WebGate Consulting AG which is part of the Appathon sponsored by IBM developerWorks, Karsten Lehmann has contributed a new project called Mindoo FTP Server. Below is his description. 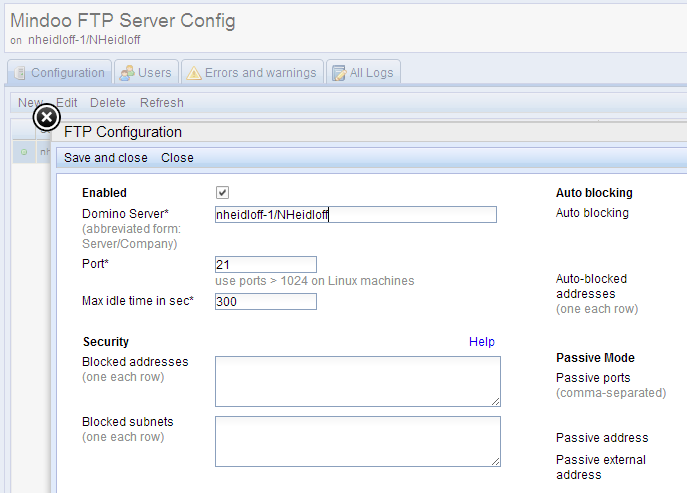 "The Mindoo FTP Server project integrates the Apache FtpServer into IBM Notes/Domino R8.5.3 or higher. An OSGi plugin on the server side that contains the actual FTP server and all required libraries, a Dojo 1.8 based graphical user interface for web browsers as well as a classic user interface for the Notes Client, both contained in a configuration database. The configuration database is used to define ports/hostnames for the server, lists to block specific FTP clients or whole IP ranges and lists of users, their access rights (read/write/which directory) and password hashes. - Server deployment via Eclipse Update Site database"
Watch the video to see the project in action and check out the screenshots.